Walking through a lava tube is one of those things that you probably don’t ever think you want to do. And then, one day, somebody says, “You should go see that lava tube!”, and you’re like, “Okay!”. 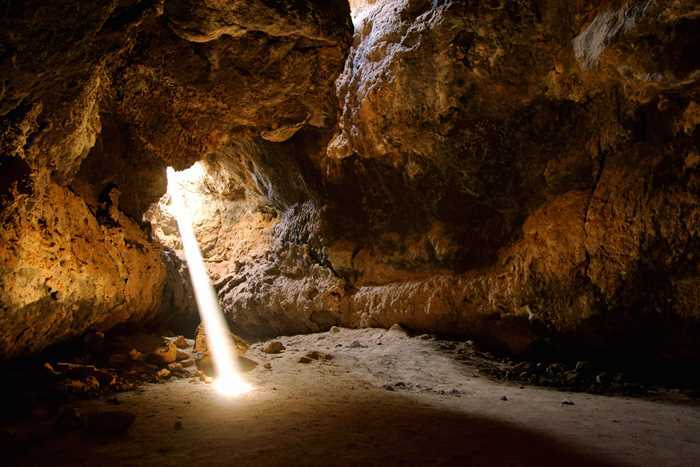 And then, an hour later, you realize how incredible it is to stand underground, surrounded by jagged rocks, staring at a piercing beam of sunlight cutting through the darkness, and you realize, this is pretty cool. From the Kelso visitor center, head north for 15 miles on Kelbaker Road. 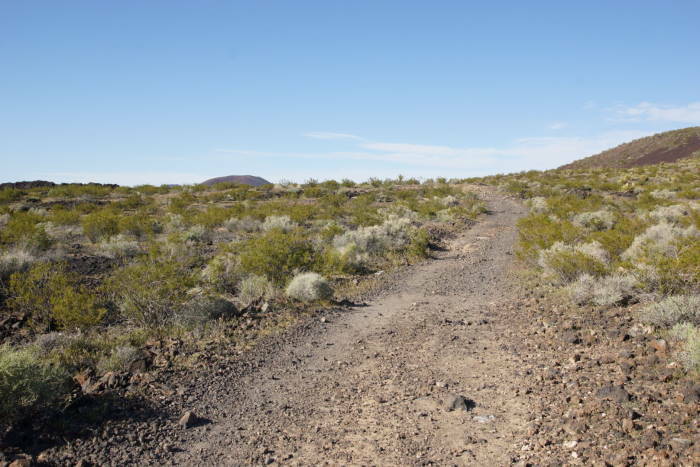 Watch for a dirt road on the right – it is not marked. Take this road for about 4.5 miles (it’s rough, but passable in most vehicles). Watch for one extremely tiny sign along the way. 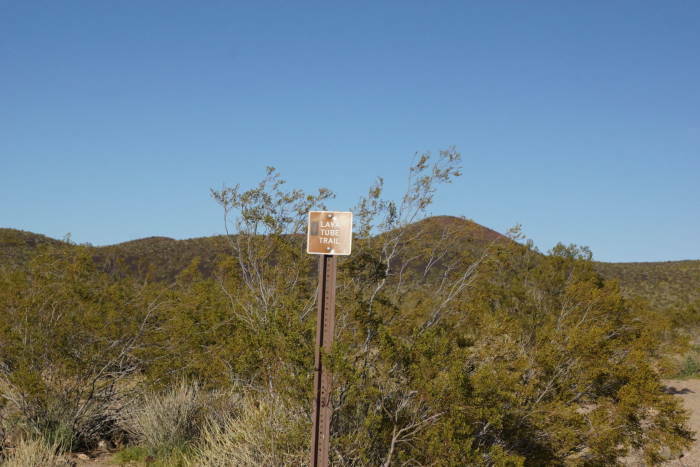 When you reach the parking area, hike up the jeep road for about a quarter-mile, until you see some fenceposts (with no fence) and a side-trail to the right. This trail takes you over to the ladder, that drops down into the tube. Now, let’s back up a bit. 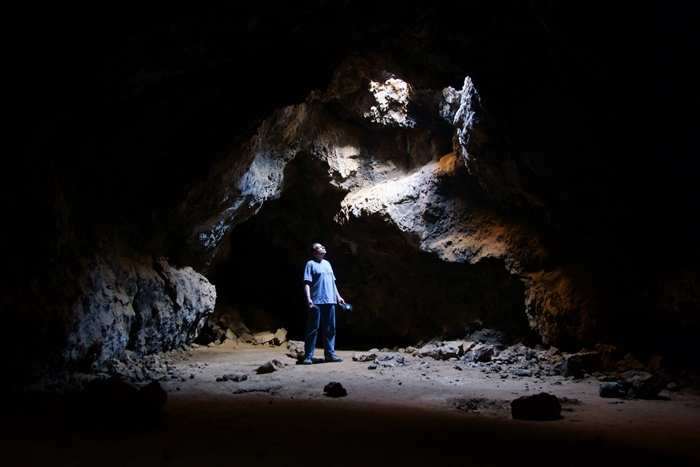 You’ll never find the lava tube without knowing where to look. 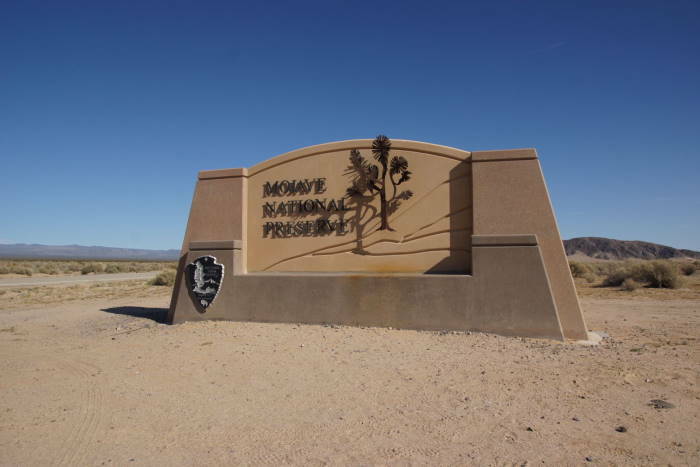 Why on earth Mojave National Preserve hasn’t put up some signs, I’ll never understand. If you’re coming from the park’s visitor center at Kelso, watch your odometer. The dirt road is 15 miles north. I was headed south from Baker, so I set Kelso as the destination on my GPS, and when I was 15 miles away, I started looking. (Alternatively, reset your odometer in Baker, then start looking for the dirt road around mile 19). … you’ll notice this tiny sign at a fork in the road. As far as I know, it’s the only sign anywhere for the lava tube. Somebody had to add an arrow to it, to make it clearer which way to go. I swear to you, it’s probably no bigger than six inches across. I wasn’t alone when I reached the parking area. Thankfully, several other people were already there, which gave me the peace of mind that I was in the right place. … then turned at this unmarked junction (notice the metal fenceposts). The entrance to the lava tube is just up the hill from there. A metal staircase allows you to easily climb down into the tube. … and enter the main chamber. There are a few openings in the ceiling, allowing some light into the tube. It’s still helpful if you have a flashlight, though – especially in that low spot. Once in the main chamber, I could see the beam of light. It’s simply stunning! But it doesn’t last for long. Just after I arrived, a boy scout troop showed up. The adults quickly realized that the beam was fading fast. He had the idea that, for the perfect picture, each kid needed to split the beam. It worked with varying success, but also involved a lot of shouting and maneuvering to get the kids to do what they were supposed to do. Your experience will likely be much more serene. … and now that the scouts were gone, I played around in the light a little. So what’s the best time to catch the beam? I don’t know. I’ve read that midday, between 11 and 1 is a good time. But my visit happened much later in the day, probably around 4 p.m. (standard time) in early March. Check with the park rangers for a better estimate. 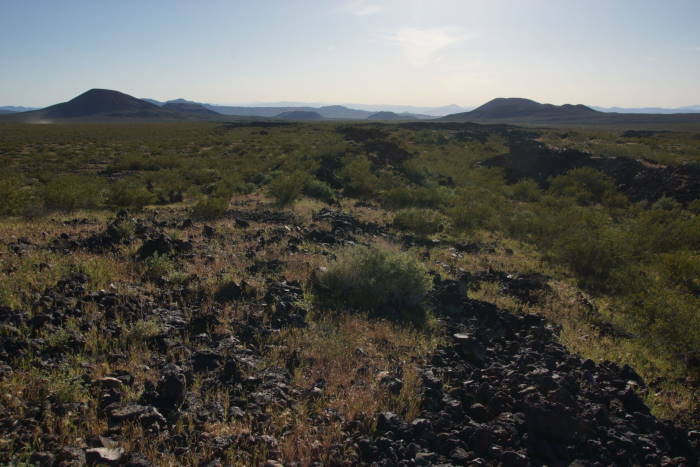 Back outside, check out the surroundings, and the lava tube is much more obvious than it was before. You’ll even be able to find the tiny hole that provided the beam of light. That’s it, right there. Just think, that entire cavern is directly below. 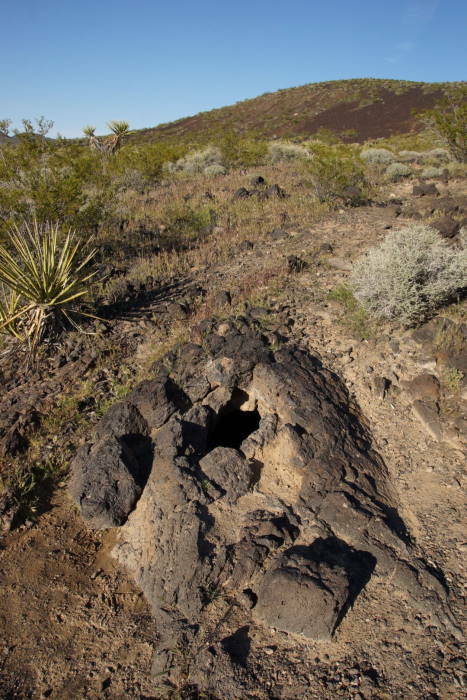 I’m not sure the Lava Tube is the one must-do attraction in Mojave National Preserve, but if you can hit it at the right time to see the beam, and you don’t mind a few miles on a bumpy dirt road, it’s worth the effort. Once you’re there, the tube is short, access is fairly easy, and your visit won’t take long.